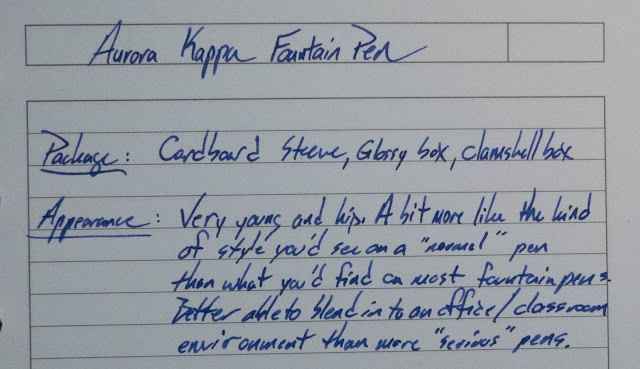 Aurora's Kappa Fountain Pen | Inkdependence! 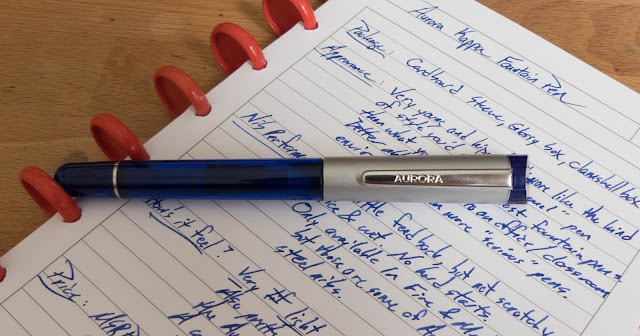 I've been reviewing a lot of Aurora and Montegrappa pens lately, and this one comes to us from Federalist Pens, who loaned it to me for review (and a giveaway!). Scroll to the bottom for the giveaway! 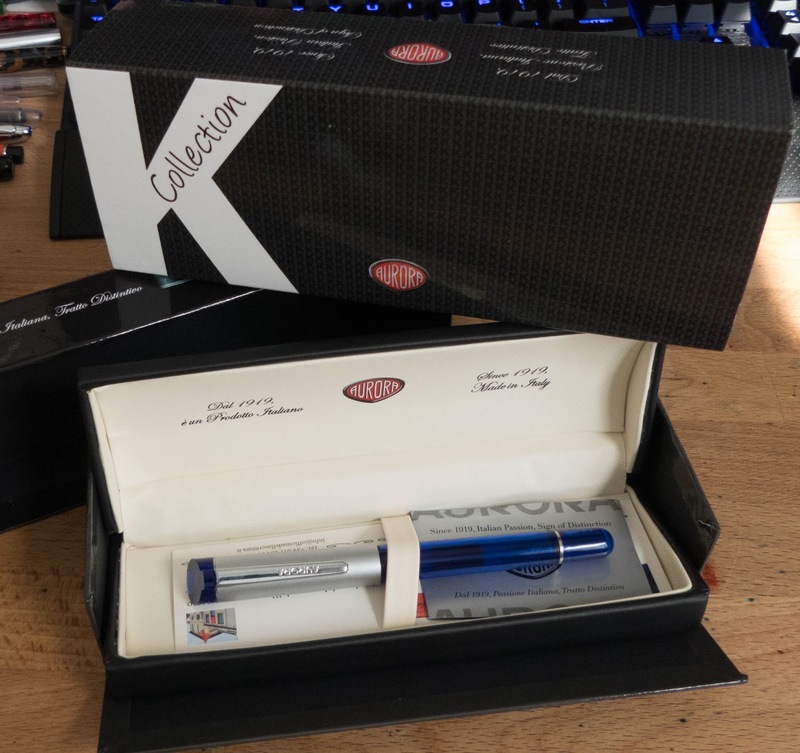 The Kappa is a collection of pens is a brand new line of pens from the venerable Italian brand. Priced under the Ipsilon model, this is their new entry level pen in rollerball, ballpoint, and fountain pen. 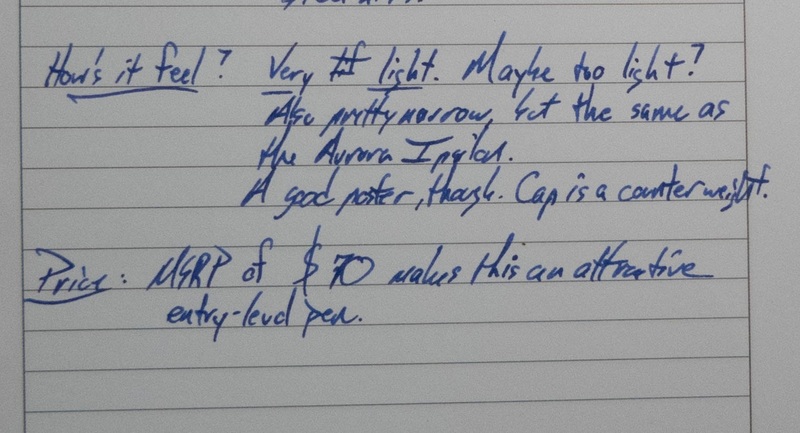 Obviously, I'm reviewing the fountain pen version. Because...duh. This one isn't like anything else that Aurora has in the lineup. It's light, translucent, and a little futuristic. It's all swoopy and angular like something from Speed Racer. The look is going to be polarizing. I'd guess that you already either like it or hate it. One virtue of this look is that it sort of resembles the pens that you can find in the office supply cabinet. It'll blend in at the table when you're in a meeting and it won't draw a whole lot of stares from your coworkers or classmates. It's sort of flashy-stealth. If you're not into the translucent blue barrel, there is a black version that doesn't appear to be translucent. The section is curved, glossy, and a little prone to fingerprints. Obviously. It's a comfortable section. 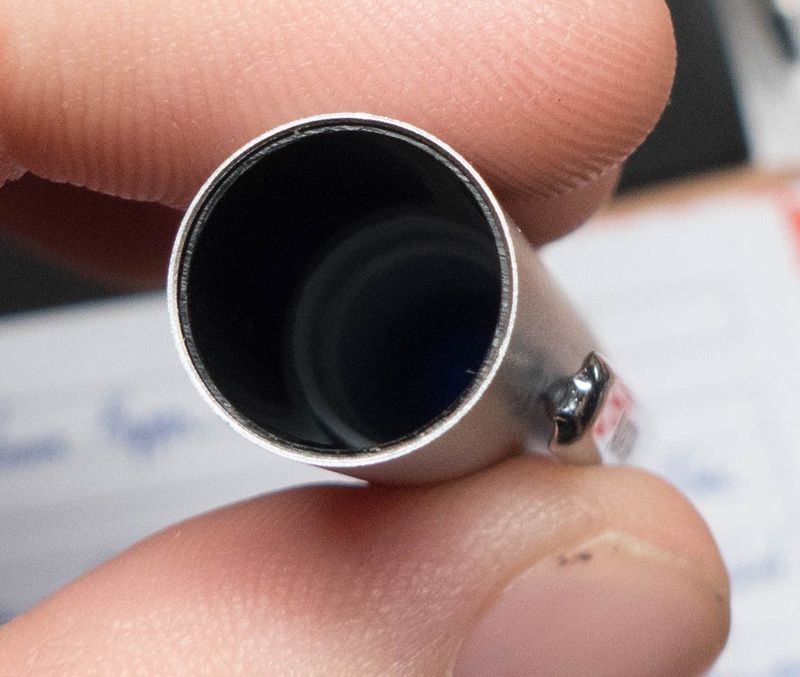 In fact, the section and the nib are identical to the Ipsilon. Here are a couple of shots of the nib, section, threads and the cartridge. That black band is actually Gorilla Tape. It's only there because the cartridge had a crack in it and it was leaking ink into the barrel. It's not standard. Also not standard with this pen: a converter. That's a disappointment with this pen. At $70 MSRP, it ought to have come with a converter. Of course, the Aurora converters are pretty expensive, so the lack partially explains how they lowered the price. The cap is actually really good. It's a metal shell with a plastic liner and a plastic inner cap. I've never had a problem getting this pen to start writing, and it hasn't dried out at all. Pretty impressive. That plastic liner also keeps the metal cap from scratching the plastic barrel when you post the pen. 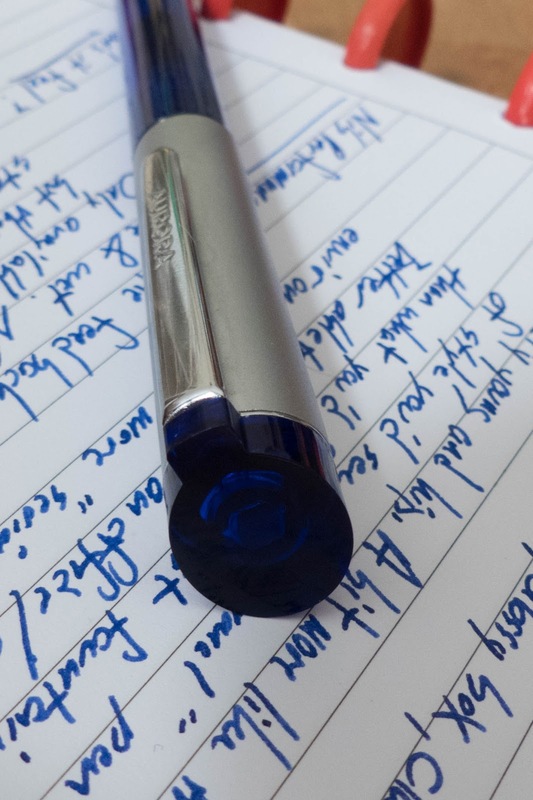 It's always best to see a pen in action! I'll have Rafflecopter pick a random winner on Saturday the 27th. Make sure you pay attention to the Rafflecopter for precise ending times and such. Thanks, again, to Federalist Pens for providing the pen for review and sponsoring the giveaway! For a future review, how about a vintage Parker 51? Great review, Mike. Thanks! I found the nib on my Ipsilon to be super broad for a medium and pretty toothy. Yours seemed smoother and finer. 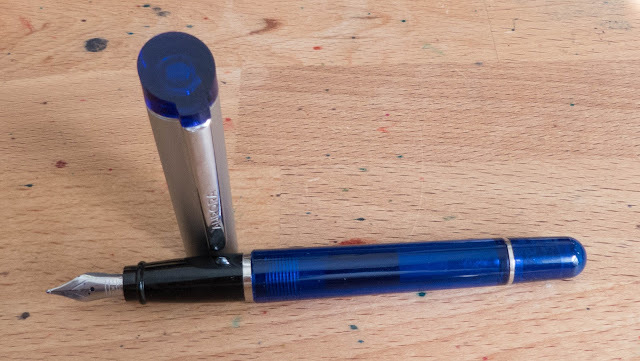 I would enjoy seeing your review or comparison of Diplomat pen models. Pretty cool pen. Thanks for the review and giveaway! 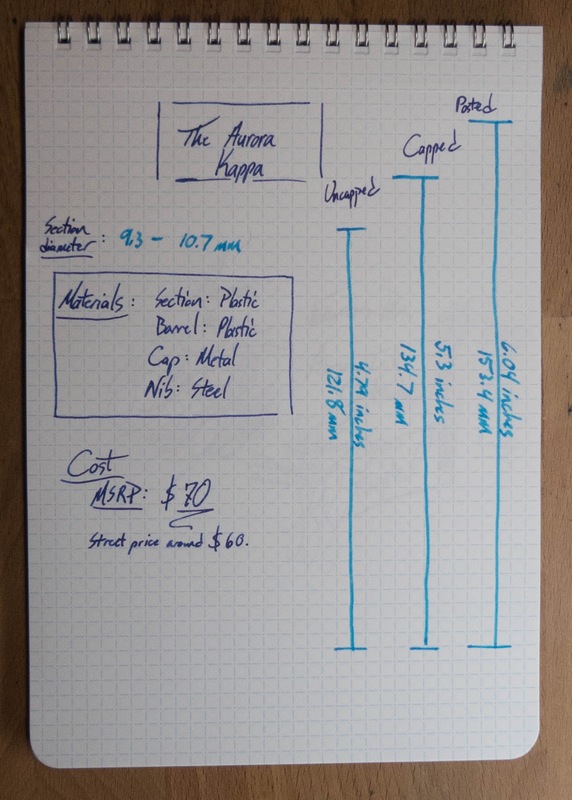 Is it possible to get an international shipment vy providing shipping Costs?! Thanks for the opportunity. Would love to try this pen out. 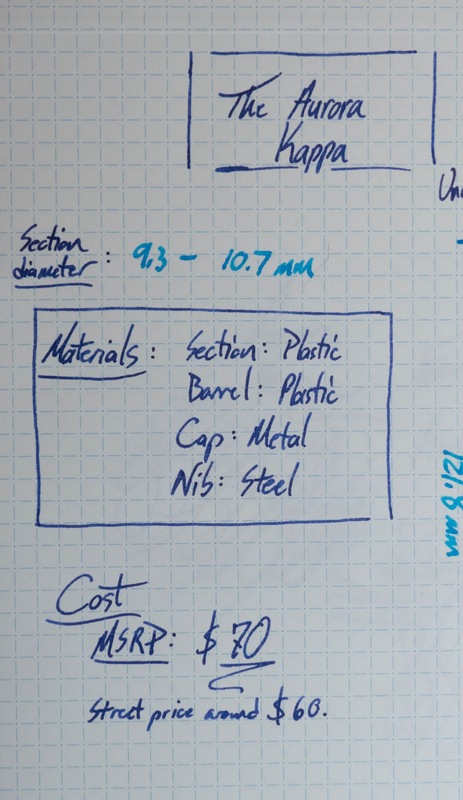 I'd like to see some custom pen makers' pen reviewed. I would lije to see a review of the new Kanilea Pen Co. Kilauea pen. The lava flow pattern looks amazing. Glad to be part of the giveaway! 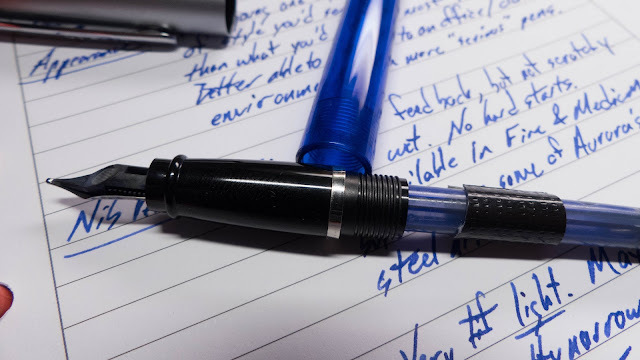 It would nice if you would review the new line of pens by MarteModena called Chronicle. Thanks. 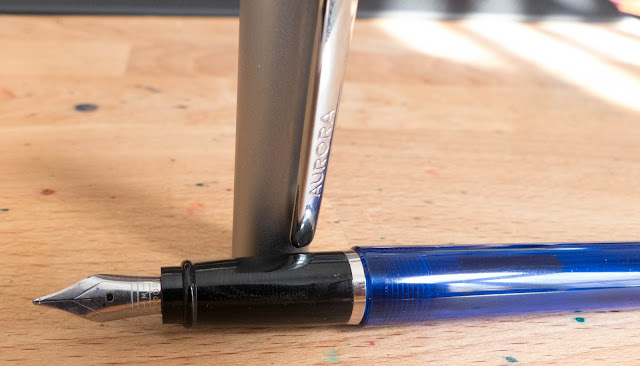 Nice tip on using a Lamy converter for Aurora pens! I like the color scheme of that pen. I saw these for the first time while I was visiting Fountain Pen Hospital in New York. I really like the look of them but wanted to see some reviews first. Thank you for the great review, I may have to add one of these to my collection. 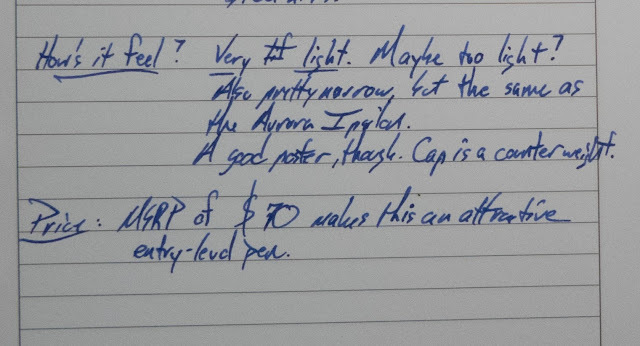 Just curious, what is the lighter blue ink used on the handwritten specs page? I would really like to see more robert oster and akkerman inks if you could find some. juliavdw- The pen model you are speaking of is the Montegrappa Fortuna Mosaica in the Turquoise finish! 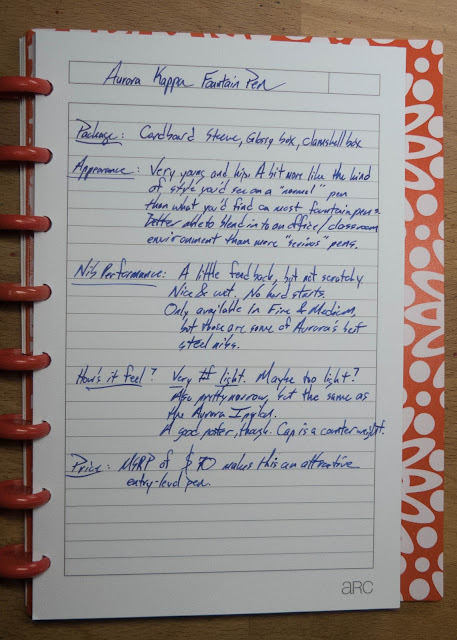 They are great looking, and are the same list as standard Fortuna Pens! They are also available @federalistpens! I'd like to see a review/comparison of entry level pens like the Pilot Prera. Thanks! 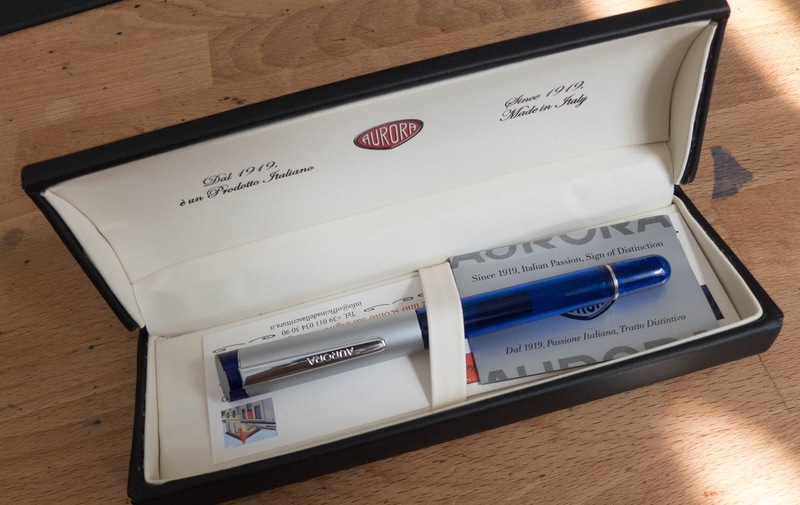 Congrats to Linda L. for winning this great pen!